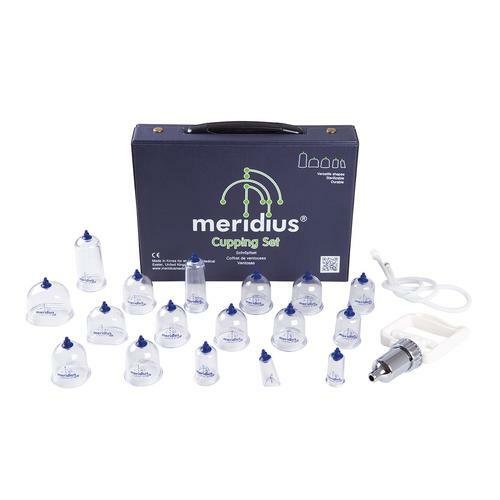 The newly introduced MERIDIUS cupping sets include: 17 acrylic cups in total, 1 hand pistol pump and 1 connecting tube, conveniently stored in a navy blue case, ideal for travelling. 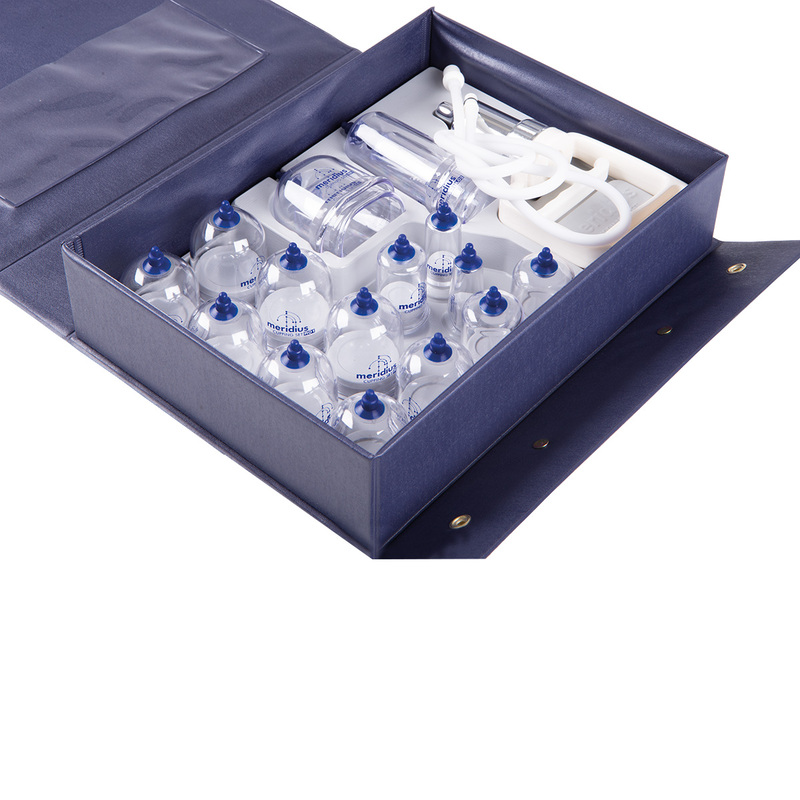 The blue silicon valve can be detached from the cup when sterilising. 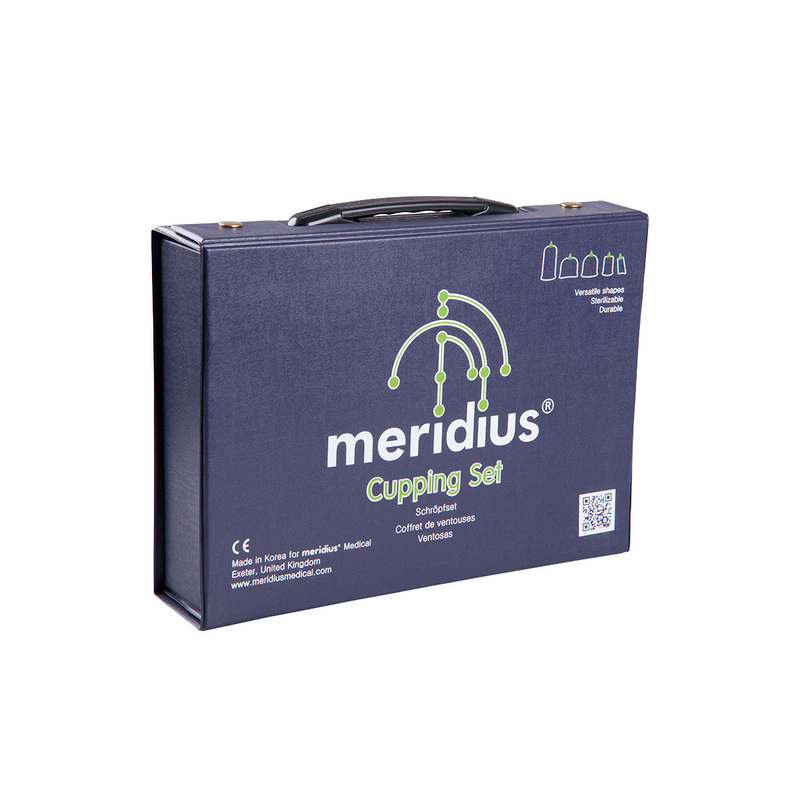 They are the most convenient cupping sets to use and to sterilize. 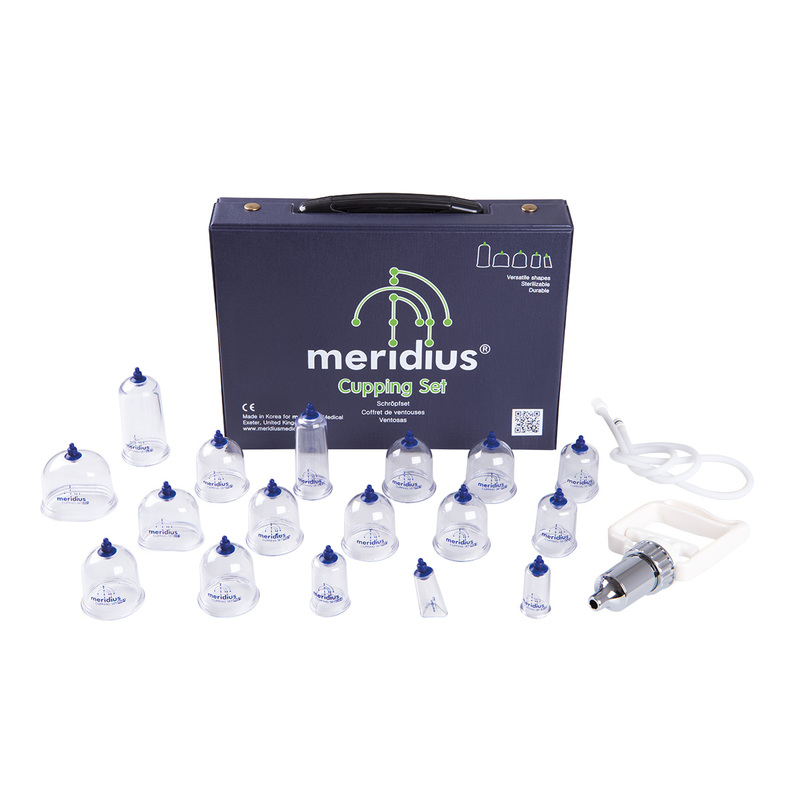 Easy disinfection/cleaning/sterilization, silicone top can be separated. The cups and silicone tops can be autoclavable. Versatile applicability owing to multiple shapes: oval for the peri-spinal region, curved bottom for the side of the body, triangle for edged body surface. High durability of the cups and silicone tops: silicone top does not crack from falling, and the thicker and solid acrylic material cups are much more sturdy. Silicone tops are easily replaceable if necessary. Size 1: 8 cups, 55mm diameter, round. Size 2: 1 cup, 43mm diameter, contoured edge for better suction. Size 3: 1 cup, 41mm diameter, contoured edge for better suction. Size 4: 1 cup, 34mm diameter, contoured edge for better suction. Size 5: 1 cup, 27mm diameter, round. Size 6: 1 cup, 23mm diameter, triangular shape for stronger suction on small area. Size 7: 1 large spine cup, 72mm (length) x 54mm (wide) x 70mm (height), for massaging spine line. Size 8: 1 small contoured spine cup, 61mm (length) x 42mm (wide) x 65mm (height). Size 9: 1 tall round massage cup, 50mm diameter x 100mm length. Easy to grasp when performing cupping massage. Size 10: 1 small contoured massage cup, 40mm diameter x 100 diameter length. Easy to grasp when performing massage cupping.